The development of some of the ccMiner forks for Nvidia GPU miners didn’t seem very active visually in the last couple of months, especially with coins such as ZCash (ZEC) that came with their own miner releases, but it hasn’t been stopped. A few days ago tpruvot has made a pre-release version of his new ccMiner 2.0 available (source) for people interested in checking it out with probably a few small things left to be ironed out before the final 2.0 release is made available. So if you are using Nvidia GPUs to mine crypto coins then you might want to give it a try and don’t forget to send a tip to your local friendly ccMiner developer for a beer or two to show your support. Do note that this release may not contain the best optimizations and fastest performance on all of the supported algorithms, so depending on what you are currently mining you may need to stick to another faster fork of ccMiner or not. 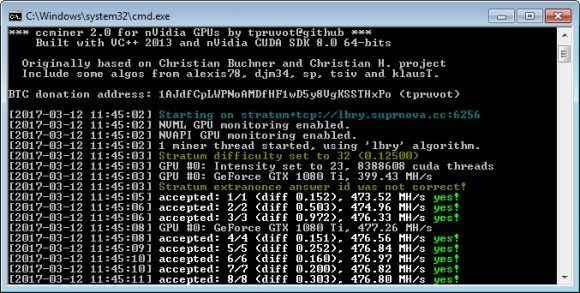 Also the CUDA 6.5 binary release does not work for LBRY mining as noted in the changelog, so either use the 8.0 release or compile with 7.5 for mining that coin.